Our tickets to Reykjavik are done. All hostels, hotels and tours are booked. Our itinerary is set! The trip is just around the corner and we are really excited, as we are for all our trips. We would be in Iceland during winters… Brrrrrr! Iceland offers a host of activities that can be done during winters only. Here is what we intend to do during six days in Iceland. We land in Reykjavik at about 3:40 pm, which really does not leave too much time to do anything during that day… or does it? 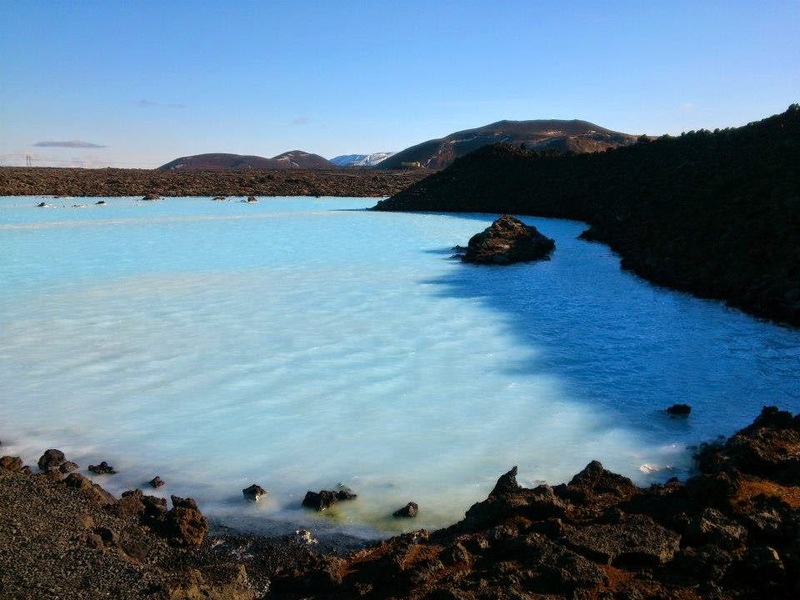 The Blue Lagoon is located close to the international airport and we have our plans set to relax in the warm waters of the Blue Lagoon the day we arrive. We hope that this will be the best remedy to wash away the fatigue of the fifteen hour long flight from Mumbai to Reykjavik. 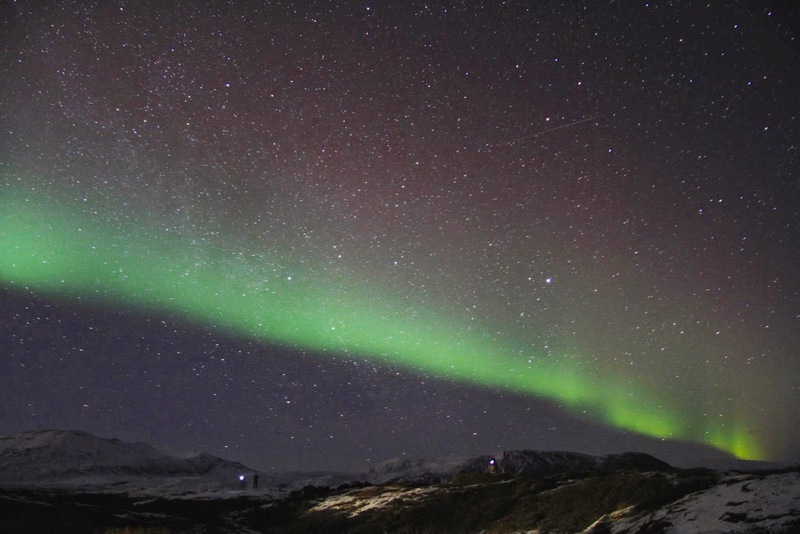 We saw the Northern Lights dance in Abisko, Sweden in 2013. However, we could not click any good pictures as we were in ski lift when Nature had put up her magnificent show. We can close our eyes and relive the sights but my love for the lens wants to have some pictures. So, off we go to Iceland to get the pictures. The evening on day one is dedicated to aurora hunting. We do hope that we will come back with plenty of pictures to share on the blog! The fault line between the Eurasian and American tectonic plates passes through Iceland and is clearly visible in the Thingvellir National Park. Continental drift continues to move the plates away from each other, resulting in earthquakes in the region. Parts of the fault lines are full of clear water with visibility as high as 100 meters. I would have loved to join the diving trip, had it not been for the biting cold. As for Ankur, he has no desire to get out of his jacket and don the wet suit and SCUBA mask! Gulfoss the largest waterfall in Iceland. It is said that from a distance, the river seems to disappear. Only when you get closer, do you realise that the river empties its water into a crack that is large enough to accommodate the entire volume. I can’t wait to hear the waterfall roar! 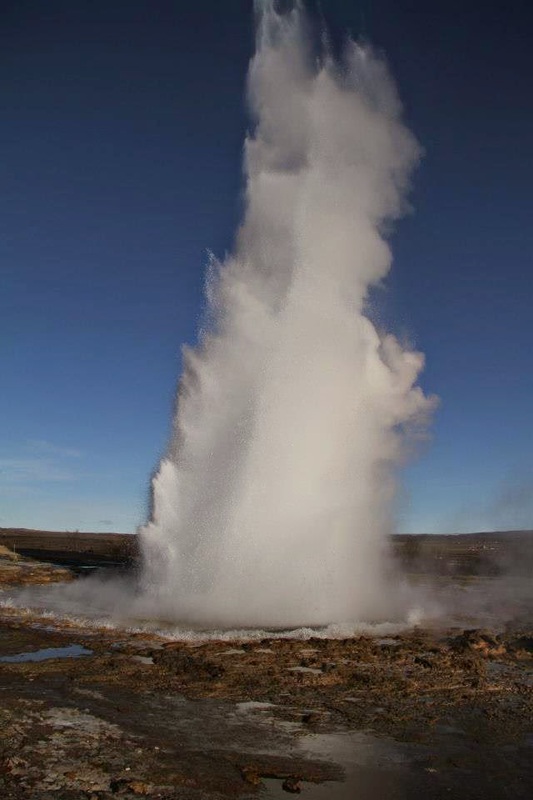 I had read about geysers in my geography book when I was in school – steaming water gushing out of the earth’s surface…like a fountain. Twenty year ago, the world wasn’t as connected as it is today and travelling from India to Iceland was a difficult and extremely expensive proposition. I never could have imagined that I would ever be able to visit Iceland to see the geysers! Dreams do come true! 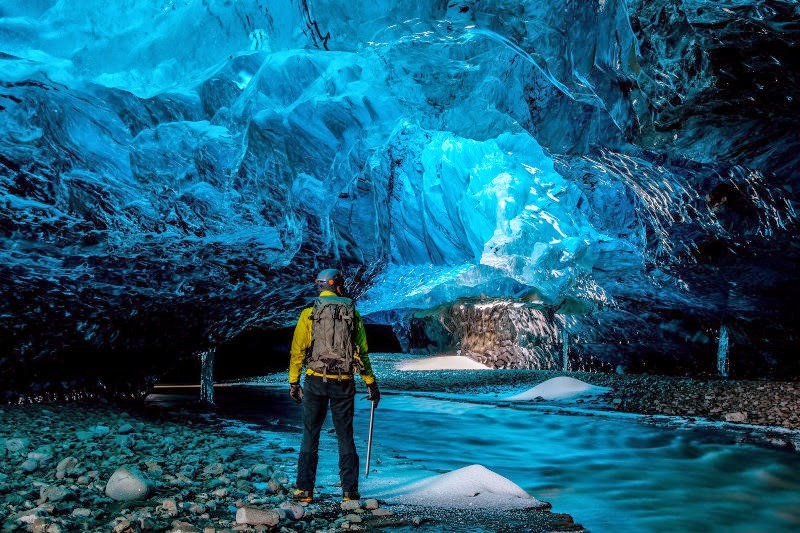 Ever since we have seen pictures of the ice caves in Iceland, we are super enthusiastic to walk in one, which can be done from November to March. Our trip was timed to ensure that we are in season for the activity. We would be doing an organised tour for three days and two nights, which would take us through the natural beauty of the South Shore and get us close to frozen sheets of ice. This lagoon has been the setting for the movie Batman. It is one of Ankur’s favourite movies and the location is a must-see for Ankur… crystal clear waters with floating blue icebergs. I haven’t seen anything like this till date and imagination fails me at this point in time! 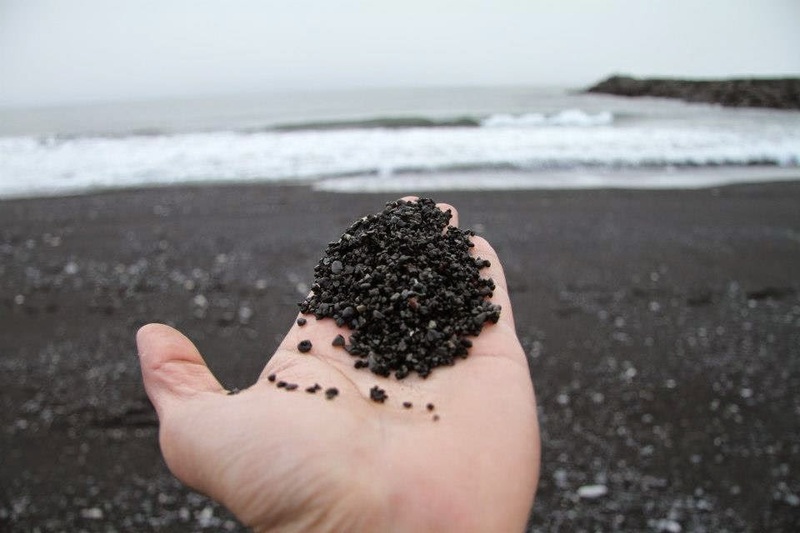 Quite a few volcanic islands have black sand beaches. We missed seeing one in Santorini as we were too busy romancing in Oia. However, this time, we do intend to admire the contrast of the black sand and blue waters at the black sand beach of Vik. Lets live it up…some adventure while we are still young? Our pitstop for adventure is the Vatnajokull National Park. The park has the largest glacier in Europe and is the second largest national park in the continent. We are excited to walk on the glacier with crampons et all. Not to forget, explore the crystal ice caves and stake some pictures inside it! This would be our last day in Iceland and we intend to spend the day exploring the capital Reykjavik and visiting the Fakasel Horse Theatre in the evening. The northernmost capital of the world offers what a lot as European cities do…outstanding churches, museums and cafes. I can’t wait to dig my fork into a skyr pie and sip some hot coffee along with it. Icelandic horses are supposed to be gentle and friendly. Ankur isn’t an animal person….do you think he will be able to make friends with one? If there is any opportunity for an animal interaction, I will surely go out of the way for it and hence, we intend to spend our last evening in the country watching these gentle creatures perform. Have you ever been to Iceland? Do you think that we are missing something that can be done during winters? Let us know and we will add it to our itinerary! Do you have a post-trip recap of what you would have done differently, or how this itinerary worked out, or what you wish you had not seen or had added in? Were any of your routes or plans diverted due to weather conditions? Planning a trip in February…..
Thankfully, all our plans went like clockwork…and we did exactly what we had planned. None of our plans were cancelled due to weather. However, the day we did the glacier walk….we were the last ones to do it for the next couple of days – a really bad snow storm kicked in! So, we were just lucky. We would have loved to see the active volcano..but it stopped erupting the day we landed! We have done snow mobile safari and husky safari in Sweden and did not include that in our itinerary. If you have never done that, you may want to explore these activities which are typically arranged in the Northern part of the country. We are heading to Iceland in Feb next year, luckily it’s my second time but I was 14 when I last went. We are looking at the ice cave tours and are still debating whether we really would like to do it. What company did you go with for it and would you recommend doing them? How long were you in the caves etc? We did this trip with Extreme Iceland and were very happy with the services. Response to all our queries was prompt and booking was easy. The guides were knowledgeable and we felt safe and well taken care of at all times. We stayed in a little guest house called Gerdi which was small, yet clean, warm and comfortable. It was very close to the shore and we could the northern lights dance from inside the guest house as well! Transport, accommodation and equipment – all were included in the package and we had to pay for the food only while we were on the trip. Ankur and I, both, would highly recommend the ice cave tour as well as a walk over the Vatnajokull glacier. This tour was coupled with the visit to the South Shore and the beach of Vik. These two days were the highlights of our trip to Iceland! Thanks for sharing your great itinerary! Curious to know if you used Reykjavik as your base for the entire trip or if you stayed overnight in different locations? Thanks for any advice you may have! Hi Daniel! We used Reykjavik as our base for 4 out of 6 nights. For two nights, we stayed at a little guest house on the south shore, close to Jokulsarlon glacier. If you intend to do a glacier walk and ice caving, it would be wise to satay on the south shore and not travel up and down from Reykjavik. However, if you do not intend to engage in these activities and only want to visit the beach of Vik, you can do a day trip from Reykjavik. We would recommend the activities …a lot of fun…especially the ice cave! Hi Sonia, lovely blog. I did the Northern Lights, the snowmobile & dogsledding in Sweden ( Kiruna) & Norway ( Lofoten Island) last year with a friend but am heading to Iceland between 19th & 26th March with my wife to make amends !! We were planning to do a self drive tour as we are not very into organised tours but I also understand that sometimes the organised tours cant be avoided. So that is really the first question. Is it possible to do the 2 night organised tour initnerary that you guys did …on our own? If yes, pros & cons please & If not, is it possible to do just the ice caving & the glacier walk as a day tour with a guide/ operator? The next question is around fitness level required. My wife & I have just crossed 50 years & are reasonably active …not supremely fit. We did a 90 min glacier walk with crampons on the Perito Moreno Glacier in Argentina 3 years back & we could handle that quite OK but I suspect if the glacier walk is for more than 3-4 hours here then we will struggle. So please give us your insights which will be of immense help. Hey Shiba! Glad you liked the blog…and super happy that you are taking your wife to Iceland…it sure is a winter dreamland! We chose to do a lot of organised tours mainly because we are from India and have never driven in the snow. We were not comfortable with the idea of driving in a snow storm or over frozen roads. Also, the organised tours were turning out to be cheaper than renting a car for a week. However, if you are comfortable driving in icy conditions, you can do all the tours by renting a car, including South Iceland…Jokulsarlon, Vatnajokull Ice Cave and Glacier Walk. I would highly recommend all these activities. We did the tour with Extreme Iceland and liked it lot. There were plenty of stops to admire the waterfalls en route in the organised tour. In case you wish to drive from Reykjavik to Jokulsarlon, you can still do the ice cave and glacier walk tour with Extreme Iceland….they will have a guided vehicle to pick you up from Jokulsarlon at a given time. You can also connect with http://gerdi.is/home/ ..where we stayed. They also have guides who do these tours. Please don’t do the ice cave without a guide…its not safe! If you managed the glacier walk in Argentina, you will be able to manage it…don’ t you worry! Sonia~I enjoyed your blog, all the questions and responses. We are planning almost an identical trip and was wondering if you could give me more information about the tours. Did you use Extreme Iceland for everything? Thank you so much for sharing all the information. I was so excited to stubble upon it — I have been researching for months and just now hit on the right words! We used Time Tours for the aurora trip from Reykjavik and really liked them. If you can’t sight the lights on one night, they usually take you along for free the next night. Also, their guide knew how to use the slr really well and helped people with the camera settings to get a good shot. We would recommend them. We did the golden circle tour with Grayline, and would recommend them for the same. The guide was great and spoke in English. She gave us time to ask questions and walk around exploring the sites. The bus was very comfortable as well. Recommend Grayline for this trip. We did the third sight seeing trip with Extreme Iceland. It was the south shore – Jokulsarlon trip with ice caving and glacier walking. South shore of Iceland is very beautiful and I would highly recommend that you do this trip. The crystal ice cave, it is one thing that you must not miss at all… I have never seen a prettier cave! The guides took care of our safety and knew a lot of stuff. The accommodation was arranged by Extreme Iceland for a night in a local guest house, which was very comfortable and had vegetarian food options. The area has very little city lights and we could see the lights dance from the garden of the guest house. There are few companies that do this trip and we were very happy with Extreme Iceland. Hope I was of help with the above. Please feel free to mail back if you have any other queries. Wonderful blog. Have already subscribed. First, about the lighting. Since it will have about 4-6 hours of daylight – is it less of an experience enjoying the rest of attractions – blue lagoon/ waterfall/ geyser etc? I have experience Oslo in November and it was pretty dull and dark. Secondly, I want to understand costs a little – since Scandinavia overall is quite expensive than one normally imagines. I am planning for my wife and I and have come about an estimate of 1.5L INR per person for the week. This is at a similar comfort level that you have planned. Would you agree to this estimate? About the people in general – comfort level tourists feel? Are they friendly? Are facilities such as toilets and food/ water regularly available when we are on the road/ tours etc. Toilets, super clean..nothing to worry. The tours stop every now and then to care care of all your needs. Almost all the stops have a small grocery to pick up a sandwich, coffee, cakes, biscuits etc. Nothing to worry at all. In fact, it is cleaner than most Western European countries. People are lovely, very warm (unlike the name of the country). Most speak very good English. I don’t anticipate you having any problems. I can connect you the people we did our tours with, once you plan what you want to do. Happy to help you in any packing queries is you may have. Also, if you wife wants a customised lopa for herself, I can connect to the lady who made it for me. Feel free to leave your queries in the comments section … Or send an email. Always happy to help the travellers’ tribe grow! Your blog is great! I am planning a 5 day trip to Iceland at the beginning of January with my mom. We are not sure about renting a car, and are leaning towards not doing so because of the icy roads. How did you get from Reyjavik to the South Shore/other sites that you did tours from? Did you do the multi-day tours, or did you take the busses separately from tours? I have heard that busses in general are not very reliable around this time. Please let me know! Hi Sondra! Glad you liked the blog. We used the tour companies to do our trip – Grayline for Golden Circle, Extreme Iceland for South Shore and Time Tours for Aurora Watching. I would highly recommend these companies … buses were very comfortable, stopped for loo and snack breaks and were well heated. The driver and guides knew things very well. I would not recommend driving in Iceland during winters unless you are experienced in driving on snow and ice. Lastly, if the weather conditions allow a tour, the buses will surely do it. If the buses are not doing the tour, then it would not be wise do it by yourself. The only reasons that buses and flights get cancelled are weather related … lots of snow, high speed winds etc. And oh, highly recommend doing the crystal ice cave tour in south Iceland … we totally loved it! Hi sonia! I am trying to plan my first out of country trip to iceland december’17. I would like to go when there is a high chance of seeing the northern lights. How do you feel about traveling to iceland during this time? Will i be able to do most activities without a problem? Also how expensive is traveling by bus? I would be too scared to rent a car since I have never even seen snow before! Hi Ajay, we did the tour in Feb and would recommend the same month. The nights are too long in December and hence, second half of Feb is a better time. We used Grayline for Golden Circle and a couple of other tours and loved their services. We did the south shore and glacier walk with extreme Iceland, including the hotel stay in south Iceland and the equipment and guided tour for the glacier experience… thumbs up! They were great too! Hi Sonia, Thanks for all the information. We are a couple planning to do it in February 2018. 1. Wanted to understand how did you plan your tour. Did you contact all these tour operator agencies before reaching Iceland or did you cut a deal after you landed in Reykjavik. 2. An important aspect – clothing. We are from Delhi and we do have winter-wear to support 0 degrees. Is there anything specific we should be carrying. 3. Any tips related to flight operator from India and accommodation you took in there. We booked the tours in advance and would recommend that you do the same. At times, tours are booked when you want to go and that really messes up with a tight schedule if you have only a few days in Iceland. I would highly recommend buys Warmee (warmers) from India as they are much cheaper here. You will get them onnline on Amazon. On accommodation – I highly recommend Loft Hostel…great place, very well located and awesome staff. If you want privacy, you can get a room for yourself in the hostel. I would not want to stay anywhere else if I visited again! Hi, Iceland is on my bucket list, and your post has inspired me a lot. Thanks for the post. I really loved it.